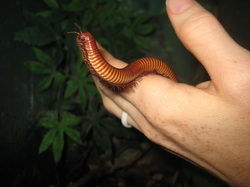 Mr. Gold - Animal Wonders Inc.
Mr. Gold is a calm and easy going millipede. He enjoys eating vegetables, leaves, and other decaying organic matter. His favorite thing to do it hide out under is damp substrate and wait until it's dark to come out and eat.